Background Hemianopia commonly complicates stroke and, less frequently, head injury and brain tumours. Patients' activities of daily living are often affected although these can be ameliorated by appropriate behavioural therapy. Identifying a field defect is the first step in the rehabilitation process. An online visual field test (an ‘app’) was developed as part of a free to use web based therapy site for patients with hemianopic alexia, called Read-Right (http://www.readright.ucl.ac.uk). This study is an attempt to validate this test by comparing with a clinical ‘gold standard’—the Humphrey automated visual field analyser. Methods 22 patients had their visual fields assessed with both techniques on the same day. The criterion validity of the Read-Right was examined by comparing it with Humphrey 10-2 and 24-2 perimetry using the following measures: (1) sensitivity and specificity; (2) κ statistics; and (3) intraclass correlation. Results Read-Right demonstrated high sensitivity and specificity, particularly for the undamaged field. In the damaged field, κ values were highly significant, especially for points along the horizontal meridian. The intraclass correlation score for the damaged field indicated excellent correlation between the two tests. Read-Right perimetry performed well on all measures. It had a tendency to under call damaged points offset from the horizontal meridian, and this and other aspects of the test will be revamped. Conclusion Read-Right is not designed to replace standardised visual perimetry; it does, however, offer a quick and easy assessment that can be used to screen patients. The test is available as part of two free to use web based therapy applications. Hemianopia is a common visual impairment, with an estimated prevalence of 0.8% in patients over 50 years of age.1 Visual loss almost always remains fixed 6 months after onset,2 impacting on many areas of life, including reading.3 We designed a diagnostic online visual field test as part of a free to use web based therapy application for patients with hemianopic alexia—Read-Right (http://www.readright.ucl.ac.uk/). Here we provide evidence for the validity of the Read-Right visual field test by comparing it with a clinical ‘gold standard’, the Humphrey automated visual field analyser (HAF). There are different types of validity. We examined the criterion related validity of Read-Right (ie, the extent to which this new measure is demonstrably related to a standard ‘real world’ measure). 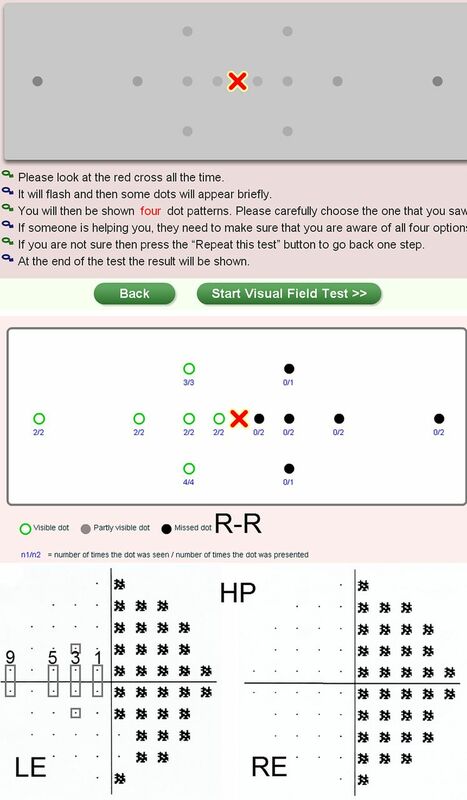 There is at least one other online visual field test available (http://www.testvision.org/test1.swf). However, as far as we are aware, this is the first study to attempt validation of such a test. Twenty-three patients were recruited from the hemianopia service at the National Hospital for Neurology and Neurosurgery. One was excluded as he was unable to comply with the HAF test; interestingly, he was able to manage Read-Right (see supplementary e-figure 1, available online only). Hence 22 subjects were entered into the analyses. Sixty four per cent were men with an average age of 56.0 years (range 25.8–79.7). All had unilateral homonymous visual field defects caused by: stroke (n=16), head injury (n=1) or intracranial tumours/arteriovenous malformations (n=5). All were in the chronic phase, >5 months post the event (mean 3.9 years, range 0.4–14.9). See supplementary e-table 1 for the full demographics (available online only). Exclusion criteria included documented cognitive impairment or visual neglect, the latter determined by history and clinical examination and multiple visual and/or ocular motor disorders. All subjects gave informed written consent. The patients' visual fields were measured using the following tests: (1) Read-Right; (2) HAF central 10-2; (3) HAF 24-2 SITA fast. The order of testing (Read-Right or HAF) was block randomised across patients. Patients underwent each test under the same low lighting conditions with corrected vision as needed. We focus on comparisons between Read-Right and the HAF 10-2 protocol here; the results of the comparison against the 24-2 protocol are included in the supplementary materials (available online only). The Read-Right test is binocular. Visual angle is controlled by having subjects sit at a fixed distance from the screen. It has an adaptive algorithm testing a six point grid in each hemi-field (figure 1). These are on the horizontal meridian at 1, 2.5, 5 and 10° eccentricity with 2 additional points 2.5° offset from both the horizontal and vertical meridians. Each test stimulus is a dark disk 0.5° in diameter. To take into account the fall in sensitivity with increasing eccentricity in normal vision, points closer to fixation have reduced contrast. Each point's contrast is set at around 5 dB suprathreshold (figure 1). Fixation is encouraged by having a flashing ‘crosshair’ and by often testing multiple points simultaneously, which could be in either or both hemi-fields. Each test stimulus is displayed for 100 ms followed by a response screen where patients have to indicate which pattern of dots they saw from a selection of four. Stimuli can be repeated without penalty. The Read-Right output is binary—that is, if all stimuli presentations at a point are seen then the point is recorded as seen. If any presentations are missed, then the point is recorded as missed. Follow this link for a video of how the test is performed: http://www.readright.ucl.ac.uk/help/h_vft.php. All patients performed the test in the clinic room where the HAF fields were tested. They used the same laptop under the same lighting conditions. Under these conditions, the background had a luminance of 110.2 Cd/m2. The points at 1, 2.5, 5 and 10° had the following values, respectively: 91, 88.1, 77.9 and 56.5 Cd/m2, giving negative contrast levels of 17%, 20%, 29% and 49%, respectively. These contrast levels were selected to be approximately 5 dB suprathreshold for a normal observer. The median number of stimuli shown was 15 (range 10–19). The average time to complete the Read-Right test was 3 min 23 s (SEM 17 s) compared with the HVF 10-2 which was 13 min 45 s (SEM 32 s) for both eyes. Top panel: Locations and intensities of the 12 points tested with the Read-Right (R-R) visual field test. Instructions for use are presented below. Middle panel: Binary output for the R-R test on a patient with a right homonymous hemianopia. The numbers record, for each point, how many times they were tested (denominator) and how many times they were reported as seen (numerator). Bottom panel: Binary output from the 10-2 Humphrey automated perimeter: the pattern deviation analysis from the same patient for left (LE) and right (RE) eyes. Single dots mean that the point was seen, black patches mean that the point was missed at the <1% threshold. The grey oblong boxes superimposed on the LE field show the points that were averaged across the horizontal meridian for comparison with the R-R test. The two grey squares show the 3° points that were compared with the R-R 2.5° offset points. The HAF 10-2 fields were tested in the standard way, one eye at a time. The stimulus size was III, with 31.5 apostilb background illumination. For output, we used the HAF pattern deviation map that is corrected for both age and sensitivity of the patient's whole visual field. We binarised these maps by taking <1% as the cut-off for an abnormal point. We averaged over both eyes. If a point was seen with one eye (>1%) but missed with the other (<1%), we rated it as seen because Read-Right is binocular. Because the HAF 10-2 grid is 2° by 2°, offset from both the horizontal and vertical meridians, it does not fully overlap with Read-Right. To compare the points on the meridian, we averaged over the upper and lower points closest to the meridian at 1, 3, 5 and 9°. To compare with the points offset at 2.5°, we used the HAF points offset at 3°. We flipped all left-sided defects so we could compare across both affected and unaffected hemi-fields. We carried out three tests of Read-Right's criterion validity. First, we generated sensitivity and specificity maps, with the assumption that HAF is the ‘gold standard’. This provides a spatially distributed measure of the classification performance of Read-Right. Second, we calculated κ values to test point to point agreement across the affected visual field. Finally, we calculated the intraclass correlation by collapsing across all points in the affected and unaffected hemi-fields; testing the hypothesis ‘Do HAF and Read-Right agree if a hemi-field is damaged or undamaged?’7 For this analysis, any missed point in the hemi-field means it is classed as damaged. The sensitivity (95–100%) for Read-Right was particularly good for the non-affected field, meaning it rarely falsely identified points as missed in the normally seeing field. For the affected hemi-field, the values were lower: sensitivity (55–100%) and specificity (75–100%), particularly for the 2.5° offset points (table 1). This suggests that the Read-Right test is under calling missed points in some patients, particularly the two points offset from the horizontal meridian. The intraclass correlation coefficient, collapsed across all six points in the affected hemi-field, was highly significant (0.884, p<0.001). A value >0.75 indicates excellent correlation. Validation of Read-Right against the 24-2 fields was similar, although only three points per hemi-field could be compared as the 24-2 grid is 6 by 6 degrees, offset from both meridians. The results are included in the supplementary materials (see e-tables 3 and 4, available online only). Some of the variability in performance between the two tests is probably caused by differences in design: (1) the points tested do not completely align (figure 1), although no pair of points were more than 1° apart; (2) Read-Right is binocular whereas HAF is monocular; (3) Read-Right attempts to control fixation by drawing attention to the fixation point, and by testing multiple points at the same time, while HAF uses the blind spot and a video of the eye to assist an operator to encourage fixation; and (4) whereas both tests are adaptive, the Read-Right test is quicker, taking patients less than 5 min to complete while the 10-2 field often takes over 12 min. This is a potential benefit of the Read-Right test and, although not tested in this study, our impression is that Read-Right may be superior to longer algorithms (whether automated like the Humphrey or manual like the Goldman) when testing patients with poor attention, low acuity or those at the extremes of age. This might explain why one patient with poor attention had his hemianopia better characterised by Read-Right compared with the Humphrey analyser (see supplementary e-figure 1, available online only). Although bedside testing is certainly the first step in characterising homonymous defects, Read-Right offers better spatial resolution, being able to accurately detect field defects that encroach within 1° of fixation. Clearly for the home based assessments, the contrast levels cannot be controlled and will depend on the characteristics of the individual monitor and ambient lighting. Hence contrast levels have been chosen to be substantially suprathreshold under most foreseeable conditions. Users are instructed to keep the ambient lighting as low as possible. Our results suggest that Read-Right would be improved by having more stimuli testing the offset points, which we are doing. We are developing a larger version that tests eight offset points in each hemi-field for another free to use therapy app for patients with visual search impairments called Eye-Search (http://www.eyesearch.ucl.ac.uk).
. Homonymous visual field defects and stroke in an older population. Stroke 2002;33:2417–20.
. Natural history of homonymous hemianopia. Neurology 2006;66:901–5.
. Pilot study on activities of daily living limitations in adults with hemianopsia. Am J Occup Ther 2009;63:626–33.
. Eye movements in reading and information processing: 20 years of research. Psychol Bull 1998;124:372–422.
. Optokinetic therapy improves text reading in patients with hemianopic alexia: a controlled trial. Neurology 2007;68:1922–30.
. Eye movement patterns in hemianopic dyslexia. Brain 1995;118:891–912.
. A comparison of tangent screen, goldmann, and humphrey perimetry in the detection and localization of occipital lesions. Ophthalmology 2000;107:527–44.
. Homonymous hemianopias: clinical-anatomic correlations in 904 cases. Neurology 2006;66:906–10. Funding This work was supported by the NIHR CBRC at University College Hospitals and funded by the Stroke Association (grant No TSA 2007/11). Ethics approval This study was approved by the University College London ethics committee.